Christopher Jackson, former dean of Concordia’s Faculty of Fine Arts and co-founder of the Studio de musique ancienne de Montréal (SMAM), died Friday, September 25, at the age of 67, from lung cancer complications. The organist, conductor and academic is remembered as a “pillar of Canada’s early music scene” in an obituary published in Le Devoir. Jackson joined the Department of Music as a full-time faculty member in 1978. He assumed several administrative roles, including dean of the Faculty of Fine Arts from 1994 until 2005. Close friend and colleague Liselyn Adams, current chair of the Department of Music, served as associate dean under Jackson. She remembers his singular drive to improve the faculty. “He brought it into a more modern university footing ... He was a brilliant leader in his own quiet way,” she says. In the late 1990s, Jackson worked with the dean of Engineering at the time, Nabil Esmail, to come up with a plan for what is now the Engineering, Computer Science and Visual Arts Integrated Complex (EV) Building. Both faculties were keen to upgrade their facilities. Jackson worked hard to bring the different Fine Arts departments closer together. “That connection and the idea of scholarship that went beyond your own narrow discipline was very important to him,” Adams says. As director of the Grey Nuns project, Jackson was also very supportive of Concordia’s successful negotiations to purchase the large heritage structure on René Lévesque Boulevard. As a musician and conductor, Jackson was widely recognized as one of Montreal’s leading figures in the international early music scene. 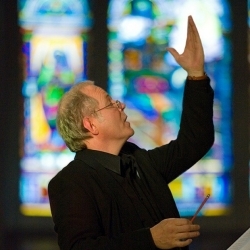 He co-founded SMAM in 1974, at a time when the movement to revive early music, played on the original instruments, was taking off in Europe and North America. “He was front and centre of that movement in Montreal,” says Adams. During its beginning years, the studio was an orchestra as well as a choir, and Adams joined as a baroque flutist shortly after moving to Montreal in 1977. Jackson was elected a fellow of the Royal Society of Canada in 2009, in recognition of his contribution to music. He leaves behind his wife, trombonist Dominique Lortie, and their three sons, Mathieu, Simon and Nicholas. Those who desire may make a memorial donation to his life's work: the Studio de Musique Ancienne de Montréal, or Concordia's Faculty of Fine Arts, via the Christopher Jackson Fund.